“Unfortunately, Cincinnati is experiencing it at an all-time high, and it needs to stop,’’ the group said in a statement released from the meeting, which was closed to the media. “Cincinnati has always held superficial discussions regarding the symptoms of racism, issued reports like ‘All-in Cincinnati’ or ‘State of Black of Cincinnati,’ but never wants to discuss the root causes of racism,’’ the statement read. Saturday, Black leaders put out a call to rally the community to address this issue of racism head on in the city of Cincinnati. 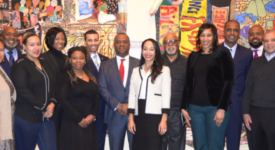 The Black Agenda group plans to attend the Wednesday, Dec. 5, City Council meeting at 6 p.m. to advise the mayor and council of their recommendations. Fund an institutional racism study approved by city council in a 9-0 vote. End the city funding of United Way. Address the affordable housing crisis in Cincinnati. Reinstate televising on Citicable the public comment portion of city council meetings. Increase transparency of the city budget process. “Institutional Racism has caused the city of Cincinnati to direct our tax dollars to the White community, leaving the other half of the city at the bottom of everything,’’ the statement reads. “The mayor and city council have known this for decades and have done little or nothing about it. The city council voted to fund a study of institutional racism, and the mayor in his last budget chose not to fund it. The group says Mayor John Cranley’s behavior has amplified the city’s institutional racism. They add that the departure of United Way’s former CEO, Michael Johnson, who is Black, three months after his arrival, exemplified even more institutional racism in Cincinnati. “There has been much talk about being an inclusive, equitable and fair city, but our outcomes in the Black community continue to keep us on the bottom. 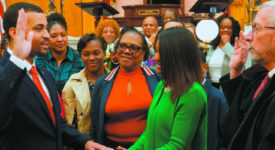 It’s time for action, and it is time to end institutional racism in this city now,’’ said Tillery, co-convenor of The Black Agenda Cincinnati, in closing. Where will this forum be held?